This past Saturday, my friend Kate (& her adorable baby Ellie!) headed to the Sappington Farmers' Market for a food blogger bake sale benefiting Share Our Strength, a nonprofit working to end childhood hunger in America. It was put together by St. Louis bloggers Kimberly of Rhubarb and Honey, Andrew of Andrew Mark Veety and Stefani Pollack of Cupcake Project, and let me tell you...I wish I could have bought one of everything that was up for sale! There were cakes, pies, cookies, brownies, cupcakes and more; some used classic flavor combos (always a good idea) and others brought some real ingenuity to their baking! 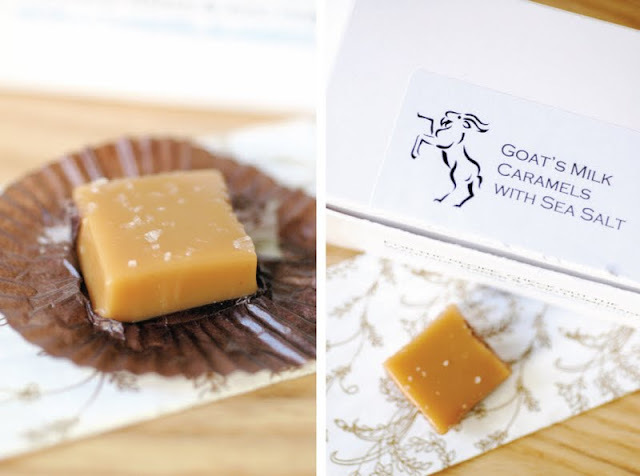 I ended up going home with a cardamom nut muffin (that I totally scarfed in the car and alas don't have a picture of it or who made it...) and a box of goat's milk caramels with sea salt (pictured above) that the hubs and I have been enjoying as a post-dinner snack for the past three days. They were made by Wannabe Baker & Avid Homemaker, and they were delicious! I hope another one of these bake sales happens in the near future. What a great way to do good with something you love to do! Side note: If you've never been to Sappington Farmers' Market...you must go! It's owned by Missouri farmers and has an amazing selection of local produce and ethnic foods. It's also indoor, so you can go any day of the week! And I don't think anyone could blame you! :) How were the gooey butter cookies? Delicious? Nice post! I also loved those caramels and the cardamom muffins! Everything was amazing! We will definitely have to do it again! For some reason I just now saw this post - thanks for the shout out on my caramels! I'm also looking forward to another Food Blogger Bake Sale: more caramels, more flavors, more chances to do some good doing what we love!